Both the hare (Latin name; Lepus) and the rabbit (Latin name: Lepus curpaeums) look very similar and are commonly found across the UK. Both are considered to be pests by UK law because of the damage that they can cause, especially to farmland. In domestic gardens too, both the hare and the rabbit can cause destruction, eating plants and vegetables that have been planted there. Despite their cute and cuddly appearance, the Lepus and Lepus Curpaeums are also known to carry fleas which can be spread to domestic pets and therefore into our homes. A flea infestation is extremely unpleasant as they cause bites and itching to both animals and humans and it is very difficult to eradicate. There are even some diseases carried by wild hares and rabbits such as yersiniosis which can be spread to humans causing severe illness in some cases. Hares are slightly different in appearance to rabbits but it can still be difficult to distinguish between the two without close inspection. Hares are generally slightly larger in size and have longer ears and bigger feet. They have back legs which are longer and stronger than their smaller counterparts. Their fur also shows black markings when compared to wild rabbits which tend to have a brownish grey coat. Although both rabbits and hares moult during the spring and autumn seasons, rabbits shed a brown coat in autumn for a grey winter coat and then shed a grey coat in spring for their brown summer coat while hares turn white in the winter (especially in areas that are prone to snowy winters.) On the other hand, both creatures sport a short bobtail. A baby rabbit (or kitten) is born blind and without fur whereas a baby hare (or leveret) is born able to see and already with fur. In behaviour too, hares and rabbits differ a little. Rabbits make their homes underground and rely on burrowing to escape from predators. They give birth to their young underground. Hares on the other hand make their nests above ground and instead of burrowing, escape predators by running away at high speed on their long and powerful legs. Hares usually appear on their own as they are solitary animals, only appearing in pairs to mate. Rabbits, conversely, live in large colonies and often appear in big groups. There is also a difference in the diet that they choose, with rabbits choosing to munch on grass, stems and vegetables while hares prefer the chewy texture of shoots, twigs, buds and bark. Both species produce numerous litters each year – somewhere between four and eight, with each litter having around three to eight babies. Because they can produce young from the age of just six months and a gestation period of only four weeks a single animal can produce a huge number of young in the six years it is likely to live in the wild. 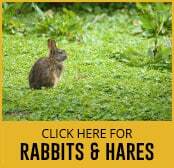 It is best to call pest experts when discovering you have an infestatation of rabbits or hares.